Bibas Greek Restaurant is old. The very worn, grey booths look like they should smell. They don't. The bar hasn't been use like it was intended in years. The few patrons there during dinner look like they want to smoke a cigarette but can't: One guy kept gnawing on a cigar. The man in front of us read his newspaper page by page, nursing his coffee. The Spanish speaking little lady who took our order looks like she has become part of the old furniture of painted brick, stain-glass chandeliers, worn carpets, and lights with burned-out bulbs. It's the kind of place Bukowski would have frequented. The restaurant is open 24-hours and may get busy from time-to-time. You seat yourself and the Greek, American and Italian menu arrive quickly. I ordered the gyros. The meat tasted a bit reheated and the tomatoes had the unmistakable tastelessness of a corporate farm. 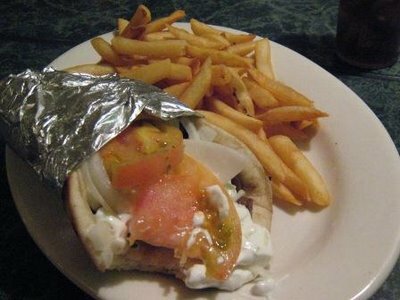 Despite these drawbacks, the gyro did have flavor and did satisfy a craving. Rekha had the Greek chicken soup and Greek salad. As she said, it's not bad for chicken soup, but not a very good Greek chicken soup. The Greek salad tastes a lot like the one at Niko Niko with a less interesting dressing. This place should satisfy a late-night craving--not a desire for a culinary experience. I won't come back for dinner, but will come back if asked by a friend and will come back when it's late and my belly growls. I think it is really cool that you know who Bukowski is. I agree that he would have dug Bibas. If you like Bukowski, you'll dig the new volumes published after his death. I saw some copies (new) at the Half-Price Books on Westheimer at Montrose. Not sure if a restaurant that Bukowski would like is a good or bad thing, but I'd like to try this one. Howdy. I'm actually a Bibas. Let me first say that I am sorry that your experience was not an outstanding one. A few years ago we leased Bibas Greek Restaurant to a new owner, and since then the quality of the food as declined. However, the lease will be expiring in another 2 years or so, and at that time I can guarantee that the food quality will improve back to what it used to be. For better Greek food now, I would suggest Bibas Greek Pizza on Memorial Drive near the park. It is still managed by Bibas' and has kept that higher quality ingredients that made our name. My personal favorite is a gyro/spanakopita pizza. If you do not have terrific food at Bibas Greek Pizza, please let us know because we want to make the best food we can, and quality is important to us. I went there 2 weeks ago and the food was really good! It IS an older restaurant, but that just adds to the character. The staff was so nice, and I felt they really wanted our group to have a good experience. There were 7 of us, and they were still very attentive and quick with our order. I can't believe anyone would have anything bad to say about it!